NOW: Still located at the First Hill corner of Boren and Alder, but in new quarters since 2004, staff members of the renamed Childhaven gathered their own children to pose for Jean Sherrard’s centennial year repeat. In 1942 a Post-Intelligencer photographer visited what were the three centers for a charitable institution then still called Seattle Day Nursery. The two branches opened in 1925 in West Seattle and in the Cascade Neighborhood, the latter on a lot later razed for the Seattle Freeway. 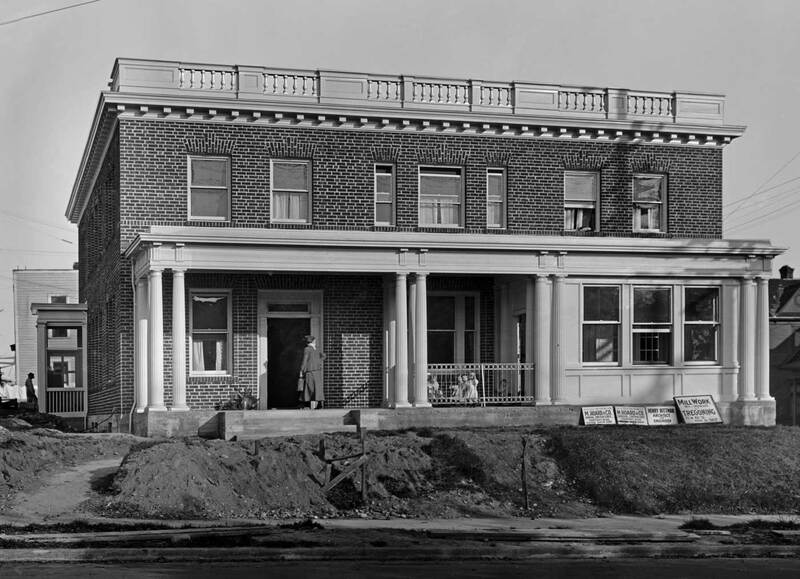 The main branch was housed in a pleasing brick home built for it in 1921 here at the six star corner of Boren, Broadway and Alder on Capitol Hill. The children tipping their cups in the historical view are all “clients,” some – maybe most – of them from homes where father is off to war and mother working on the home front, perhaps at Boeing. 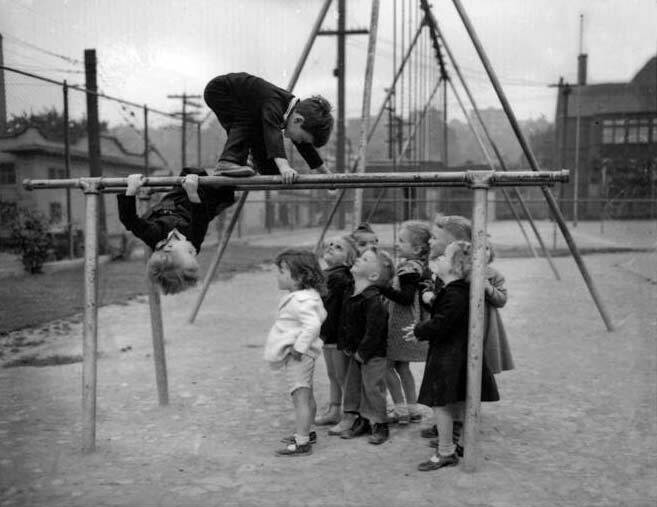 In ’42 Seattle Day Nursery was 33 years old and still run by volunteers until 1959 when a professional staff was hired. All the children in Jean’s “repeat” belong to staff members of Childhaven, the name for the day nursery since 1985. This is the institution’s Centennial year. It began in 1909 in the basement of the First Presbyterian Church as a way of helping mostly single mothers who needed to do paying work during the day. It developed into an activist advocate for the youngest among us who were born to abusive parents who themselves were often repeating a cycle of abuse put on them by their parents. Brand new in 1921, landscaping for the Seattle Day Nursery is far from finished. And yet the nursery is in use. Children appear to be looking back at the photographer across Broadway Avenue from behind the metal fence on the front porch. Among the signs leaning against the classy brick home on the right is one for Harry Bittman who is described as both architect and engineer for the new building. 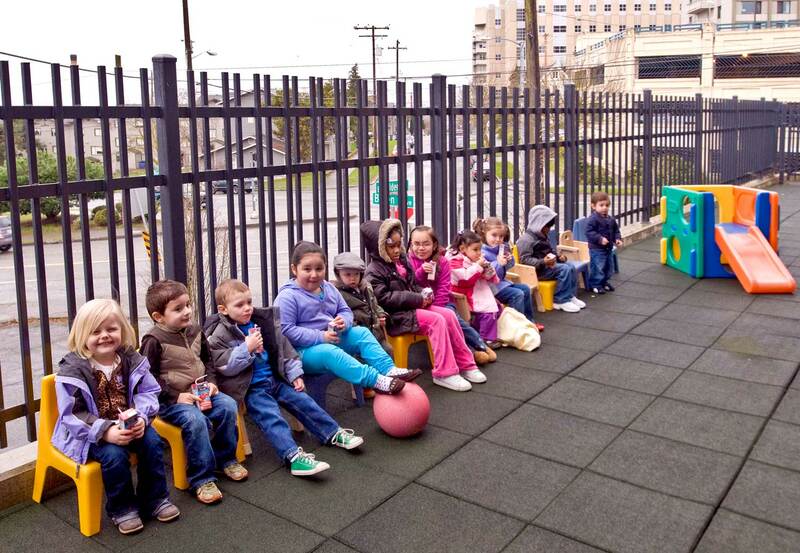 This charity began in 1909 and so is celebrating its centennial and still at this First Hill intersection of Boren and Broadway and Alder, but as Childhaven, the nursery’s “modern” name. 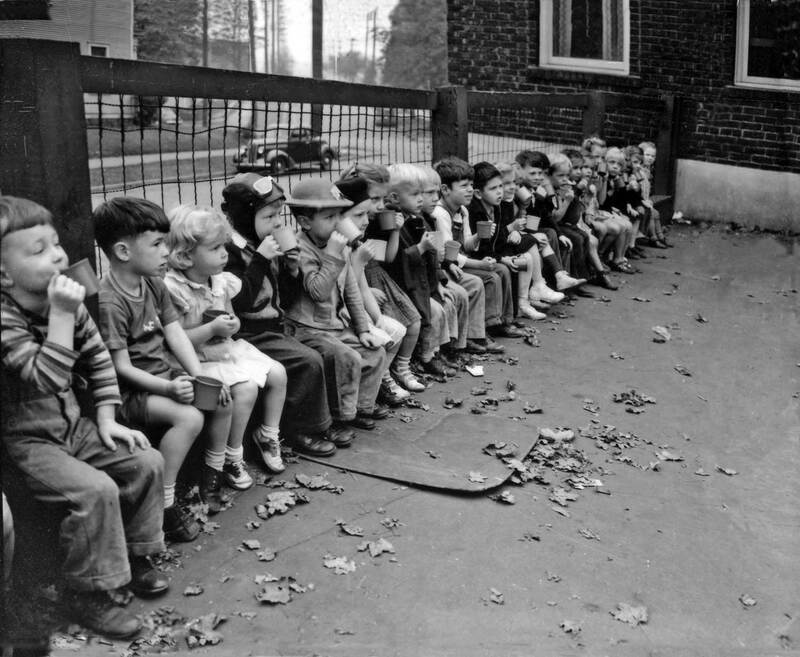 Another of the Post-Intelligencer’s 1942 records of the nursery, although here of exercising children recessed from its branch in the Cascade neighborhood to show their simian skills for the photographer. The view looks east from the Cascade playfield. Cascade school is on the right facing Pontius Avenue and Harrison Street is on the left to the far side of the high steel fence. The fence and a playfield are still in service, but the nursery and school are both gone from the Cascade neighborhood, which began it steady loss of “residential stock” and families following the Second World War, as it became increasingly a neighborhood of warehouses and light manufacturing.